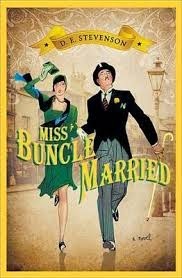 It didn't take me long to give in a purchase a copy of Miss Buncle Married, on the heels of reading the first in this series by Stevenson. Curious to embark on the next chapter of Miss Buncle's life, I swooped on into the read. Although this book was very fun and it was enjoyable to find out what happens to Miss Buncle after she gets married I thought this title lacked the charm that is the first story. That is not to say that it is bad at all or that I didn't enjoy it - because I did! I just liked the first title better. The character of Mrs. Abbott (nee Buncle) is further developed in this sequel. Unlike the first book, Mrs. Abbott isn't in the process of writing books, but in establishing a household. We see her setting up house and getting to know people in her new community. She does write a little bit, but nothing for publication. This book is strictly about her development as a human being in relationship to others around her. Side plots abound, thanks to the neighbors and you meet a range of characters. There is hidden romance, children wrecking havoc through untamed mischievousness, ghosts that aunt and neurotic rich folk. My favorite character in this book is not Mrs. Abbott but I do like the way that Stevenson solidifies her as a person with a life all of their own. Probably the thing I latched onto the most in the character of Mrs. Abbott is the fact that she is able to write down her thoughts and communicate through the written word. However, when it comes to actual, live conversation she goes a bit tongue tied. When she writes, she's a regular word smith; when she speaks she sounds simple. I so very much identify with that! Really and truly, I hate it when people ask me in person what I think about such-and-such a book. I can never string three words together when asked to answer that question audibly. (Are you surprised? My blog posts can wax eloquent at times. You might assume I'm a talk-a-holic. You would be wrong.) When I'm trying to say what I'm thinking outloud, words just fly out of my head. I very frequently use the wrong words and end up meaning something completely different than what I meant. I don't think I think fast enough to communicate deep thoughts when talking aloud. I'd rather write blog posts. (Then, sometimes when I write it out I'm able to say it with greater ease aloud.) Alas, Miss Buncle/Mrs. Abbott suffers the same and so I sympathized with her a great deal and frowned a bit when she struggled to communicate with others face-to-face. It's such a strange phenomenon (and such a frustrating one for me!) and I wonder if D.E. Stevenson suffered from the same "condition" because she describes it so well in this book. I'm still very much engaged with Stevenson's writing. Her style is slow and easy and, next to Mitford (and Miss Read), I find her books wonderful and cozy reads. I took my time reading this one (i.e., I spent 5 days reading it instead of 2) and while I found it slower than the first book, I enjoyed it just the same in the end. No retracting my original statements about finding D.E. Stevenson a perfect "holiday" read. Look her up! I'll look forward to another of her works shortly. I have that same affliction. :-) Often I come up with all sorts of things I could have responded later, but I just am not quick at thinking "on my feet." Or sometimes I do the opposite and try to explain and ramble around and see people's eyes glaze over as I talk too much and think, "I should have just stayed quiet!" But more often I don't say much because I haven't had time to process what I am thinking. You have me wanting to read this series so bad! I'm going to have to push my library into getting a copy. Bravo! You do write splendid reviews, Carrie...a skill I envy. I am enjoying these books a second time through your reviews.